A rendering of the proposed micro hotel in the Theatre District. The tiny rooms at a hotel proposed for the Theater District are about to get even smaller. Amherst Media Investors Boston, which has been trying to develop the site next to the Wilbur Theatre for years, now wants to both expand the size of the proposed hotel, and shrink the size of its rooms. The rooms would be 180 square feet, just 18 feet by 10. Micro living is all the rage these days, with apartments under 450 square feet and hotel rooms under 200 square feet both built and planned in Boston. Hotels in New York, London, and Amsterdam have embraced the model, with berths at an airport hotel in the Netherlands as small as 75 square feet. That’s barely twice the size of a queen-size mattress. 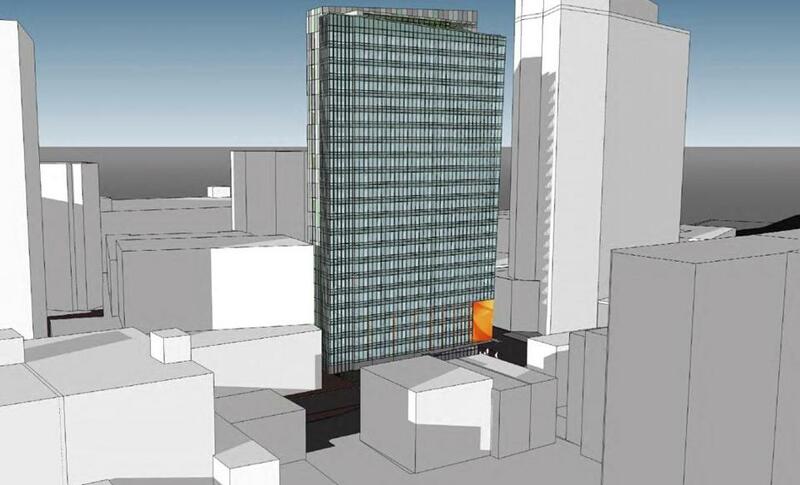 A micro hotel project planned for the Seaport, the Yotel, is fully permitted, according to Nicholas Martin, a spokesman for the Boston Redevelopment Authority, but is currently delayed by litigation involving an abutter. The rooms would range in size from 160 to 200 square feet. In the Theatre District project, Amherst Media said the changes to its proposed hotel will not have a significant impact on traffic because the smaller rooms would probably draw more millennials and other customers who would be less likely to drive. The new design includes the three-story electronic billboard, meant to give the area a Times Square feel, that was initially proposed for the site. Amherst Media Investors, the company Van Fossan manages, was picked by the city to develop the site, known as Parcel P-7A, in 2005. Before the recession struck, the company planned to build condos at the site, he said. Since 2012, Amherst and other companies have been hammering out the details of a hotel.